The Cambridge Declaration of . . . What, Exactly? Sometimes you open a document you find on the Internet and it leaves you with, shall we say, many questions as to what is in the document and what it means. Especially when the entire document consists of nothing but . . . question marks. Sometimes when a PDF file gets created on a Windows platform, something gets lost in translation when opened in Preview on a Macintosh. At the Francis Crick Memorial Conference in Cambridge, UK, this past July, scientists gathered to discuss the position that consciousness existing in human and non-human animals. 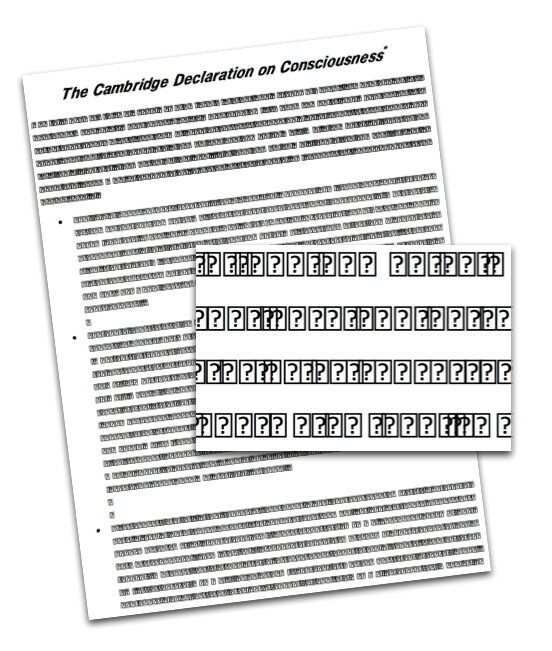 At the conference emerged The Cambridge Declaration of Consciousness which was signed by many prominent scientists. "The absence of a neocortex," the document states (so I hear, because I haven't actually been able to read it myself), "does not appear to preclude an organism from experiencing affective states. Convergent evidence indicates that non-human animals have the neuroanatomical, neurochemical, and neurophysiological substrates of conscious states along with the capacity to exhibit intentional behaviors." Frankly, I am surprised that it has taken this long for this kind of notion to gain acceptance. It has seemed intuitively obvious to me my whole life that all kinds of animals are "conscious" and you don't see them getting hung up about it. Only some self-centered humans go on and on about how they're special and different and given carte blanche to treat animals poorly. Surely anyone with half a brain, so to speak, can discern that elephants, dolphins, sharks, whales, horses, dogs, cats, birds, all sorts of animals, are clearly "conscious". This point of view always seemed completely normal and natural to me. And yes I think it is important to make a distinction between consciousness and intelligence. They are not the same thing. One of these days I hope to unlock the mystery of what this PDF actually says.